In other Ellis Athletic Center blog posts, we have covered the benefits of corporate wellness for the company as well as the benefits for the employees. All around, corporate wellness is a wonderful program to enact because it promotes productivity, employee well-being, and access to quality fitness at a more affordable rate. You would think that these benefits alone would encourage employees to participate in corporate fitness programs, but this is not always the case. We have compiled the strategies that we have seen most effectively encourage participation in corporate wellness programs. 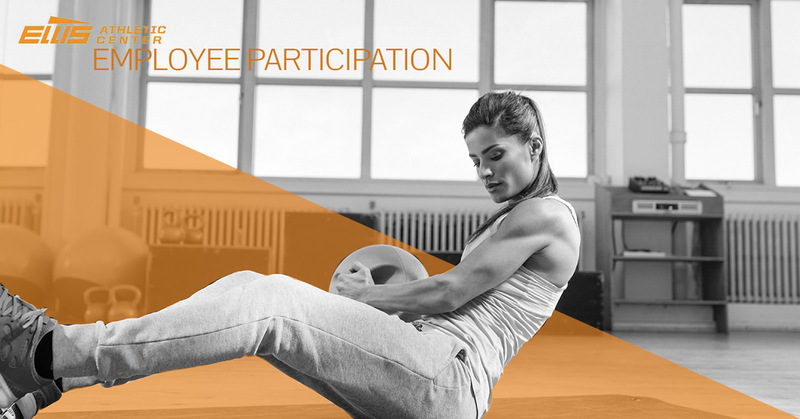 After all, your company provides corporate fitness as a benefit for your employees, and you need employee participation to make it work! In general, there is no better way to encourage participation than making it into a good-natured competition. Humans are extrinsically motivated, which means that they are more likely to participate when there is something to “win.” Consider a company-wide competition where the employee who checks in most frequently at your chosen fitness partner wins a gift card. Beyond sheer frequency, you could also have prizes for those who take pictures wearing company merchandise at the fitness center. Also consider rewarding participants with gift cards to practical places, like the juice bar at the fitness center. This way, you also encourage them to make this particular gym a part of their routine. If your company doesn’t have a wellness committee already, consider delegating the role of starting one to an employee who cares about fitness and can motivate others to participate in the employee wellness program. When other employees see emails about a wellness committee, posters they create, and meetings they schedule, the wellness committee gains a visible presence in your office space. Even if people had already written off the corporate wellness program, this now revitalizes the effort and makes health and wellness a more noticeable part of your office. When teammates of wellness committee members hear about the happenings and even consider joining for themselves, then it can really become a positive force in your office culture. Rather than partnering with some generic gym chain, it really goes a long way to partner with a local gym. Your employees will support local business, and chances are they’ll have a convenient drive to the fitness center. It is even better to partner with a gym that has different facilities so that you can meet the needs of your diverse employee population. Local gyms with athletic facilities, group fitness classes, gym for kids activities, and childcare options provide options for everyone, and thus make corporate fitness programs more attractive. Additionally, local gyms tend to offer special events, camps for kids, and community activities more than corporate gyms. These activities provide an opportunity for your company and employees to get involved in community events, which is always good for public reputation and morale. Often, employees do not participate in corporate wellness programs because they do not know the details — sometimes, they don’t even know the program exists! You can’t rely on current employees or even wellness committee members to unofficially disseminate the message to new or non-participating employees. Instead, consider adding a brief overview of your corporate wellness program into your new-hire on-boarding process. Make sure the fitness center and monthly rates are clear, and be sure to show your employee how much money they save by joining a corporate wellness program. Do you or managers at your company participate in your corporate wellness program? Chances are, if the corporate wellness program you chose doesn’t satisfy your fitness needs, then it won’t be worth it to your employees either. Partner with a local gym where you will actually work out, and make sure to share your fitness schedule with your employees so they can see that you practice what you preach when it comes to corporate fitness; any maybe schedule a workout at a different time of day to avoid sweating next to the CEO. Ellis Athletic Center in Newtown Square offers corporate fitness memberships because we know how these programs can help the entire community. When employees are happier and more productive, our local businesses are more productive and profitable. Contact us today to learn more about corporate wellness programs for your company.